More progress made today on the kitchen, but not much to actually show for it. A lot of the day was spent doing the same sort of activities as the past few: machining timber to size, joining it up with glue (and Dominos as a whole). 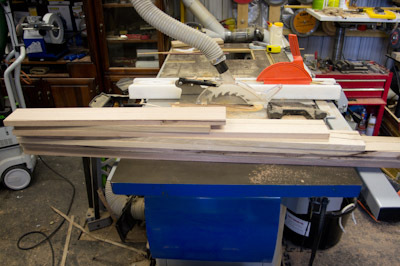 I am still trying to maximise the yield I get from the timber, keeping any offcut of decent width, or length, and surprisingly so much of it is able to be used. I had a whole stack of offcuts, all thicknessed up just in case, and saw they were the perfect size and thickness for the base of the units. What is more, the pile was exactly the right number, and they had already been cut to length, which was exactly the length I needed. I’m sure it isn’t coincidental (being cut from stock that was the right size), but it is cool when it happens in any case. 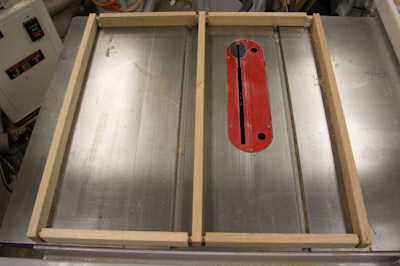 The tops of the unit are done, excluding the machining (cutting a sink opening, and machining the elements into the stove surface). Speaking of sinks, I have started preparing the material for the wooden sink. This time I am doing it how I always planned, and envisaged it to be – laminated with contrasting timbers. 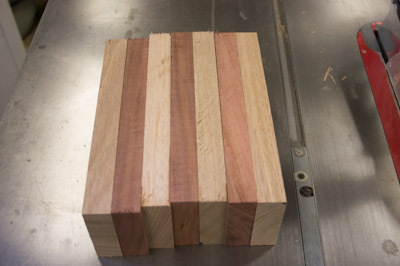 The light timber is the Tassie Oak, the red timber is Australian Red Gum. 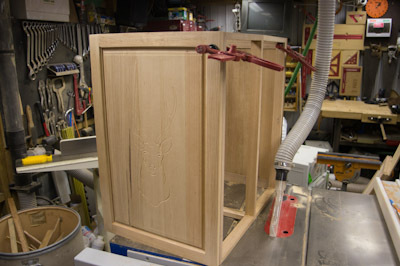 To create the final sink, each lamination needs to be machined before glueup. Way too hard afterwards! 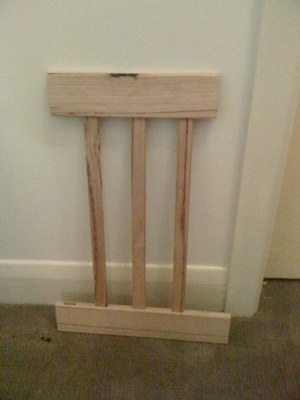 So a whole bunch of clamps later (I’m rapidly running out), I managed to get it all glued up, ready for the net stage. So a day where progress seemed slow to non existent, but it will prove itself during assembly, where all these stacks of dressed timber about the place will transform into the various parts of the project. Gave the toy kitchen project a good nudge today, despite the heat! I would have hoped to have more done, but it takes time dressing boards down from scratch, resizing and all. And I’m designing as I go as well! 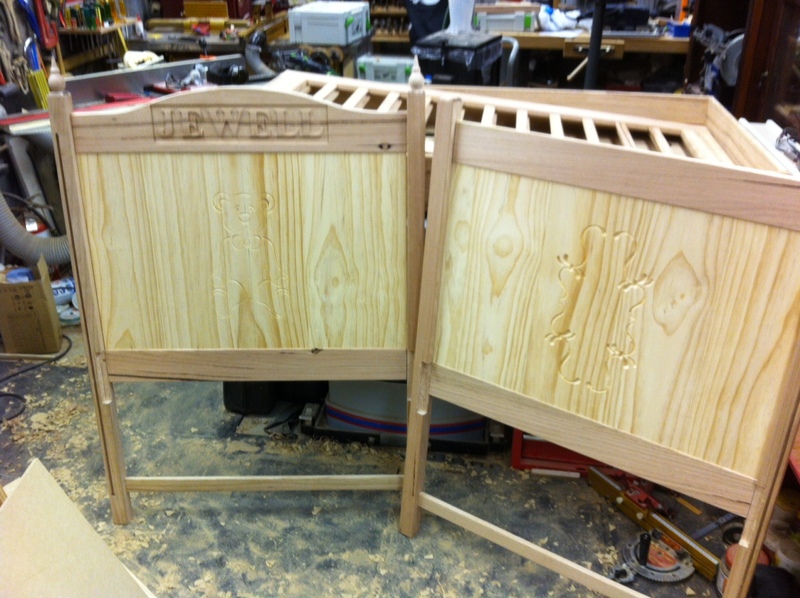 This is the front of the carcass, partially assembled using Dominos to ensure it all lines up. To deal with the central post, I used the Domino to punch right through, then a longer Domino (50mm) so there was enough proud to have plenty of depth for the cross members. 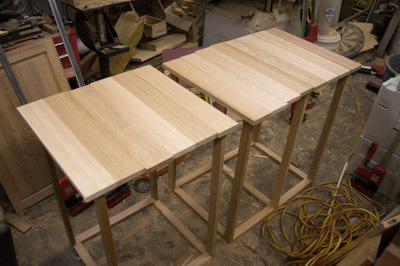 With the front and rear portions of the carcass glued up, it was time to join the two together. Rather than use the sides as a structural member, I decided to complete the carcass separately, then attach the sides afterwards. 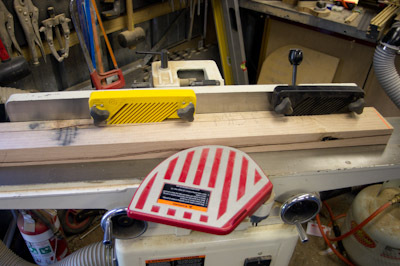 To get an accurate length for the remaining pieces, I clamped the sides to the carcass, then measured. 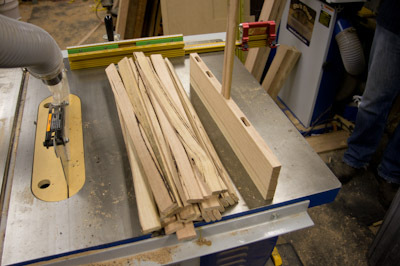 These were also Dominoed, then the whole lot was glued and clamped. 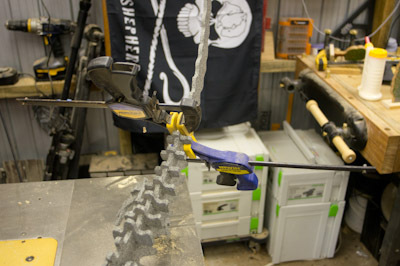 The old adage that you cannot have too many clamps is so right. I had all the Bessey clamps, and the two Jet clamps, and still had to resort to some others (that don’t have the same clamping force). 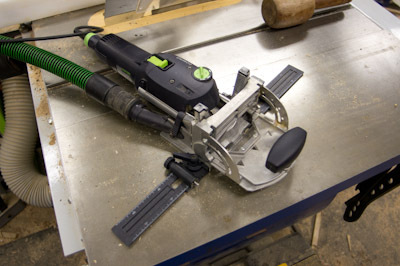 Another thing: as much as I always thought that Jet and Bessey were the equivalent of each other, with pros and cons to both, I have started to significantly favour the Bessey. The ease to resize the clamp plays a big deal in being happy with the clamp as a whole, and the Jet is painful compared to the Bessey. Just before I ran out of shed time for the day, I got a bunch of shortcuts/shorter sections, and dressed them up. Then between the stove and the cupboard/sink, I found I had just the right number. Not bad for an eyechrometer! 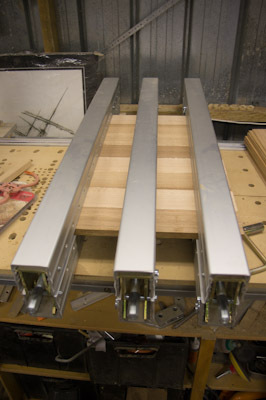 After sizing to length, they were glued, and clamped in the Frontline clamps. So that is where it sits at the moment. Tomorrow the other top will be glued up, and progress made on the features that will turn this from an elaborate set of cupboards into a kitchen. Probably seems like each ‘progress’ report is no different to the previous with the cot build, but there are a lot of small steps in between. 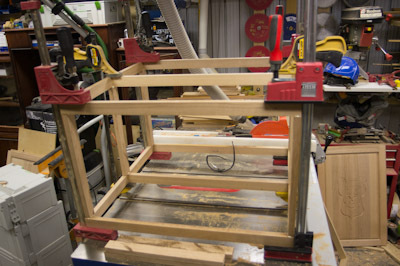 During glue-up, the Bessey K body clamps really started to shine. The more I use them, the better I like them. Increased my collection with a couple of 1250mm ones from Carba-Tec, along with a couple of Bessey extenders. 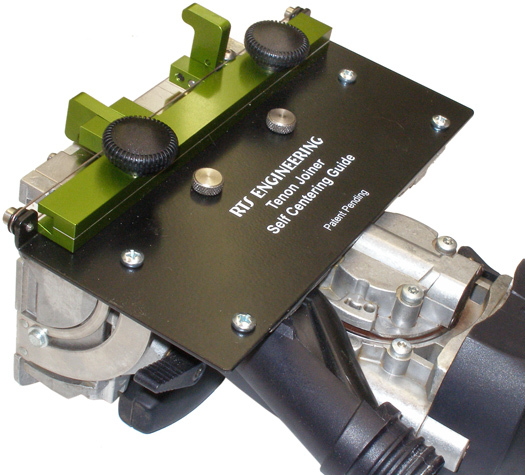 With all the components pretty much completed, what the final product looks like is becoming increasingly apparent. And reflecting the multitude sketches of the various aspects of the project. 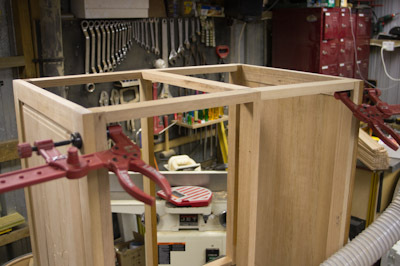 Building a project from pre-designed plans is a great way to learn woodworking concepts and techniques, but all the real problem-solving has been taken care-of. It is not the best way to build, but I really enjoy building, designing and problem solving all at the same time, as in creating without pre-designed plans, and working out each step as I go. Woodworking is a great mental exercise. and just in case you were wondering just how big that is…. The Domino XL is…well, I’m not sure why you need such a monster, but where it does get used, you can be sure that joint will survive anything thrown at it!! 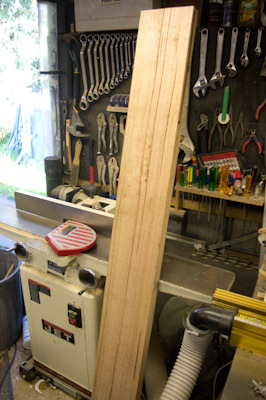 The strongest of workbenches, the heaviest of doors, yes – I can see how useful the XL would be. Maxing out at 70mm for the depth of cut is pretty impressive for a hand-held mortiser. 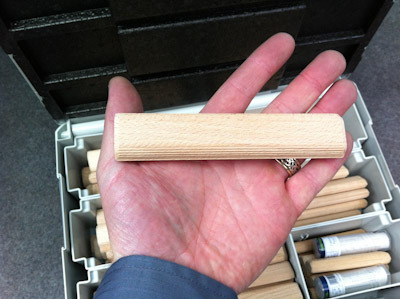 30mm – 140mm Dominos, widths of 8mm to 14mm. Kindergarten is about to start again, so typically, I have a few jobs I promised that have been left until the 11th hour. Couple of seats needing the seat rescrewed, and a few play trees that have become separated from their bases. Sorry, but that is just the reality. 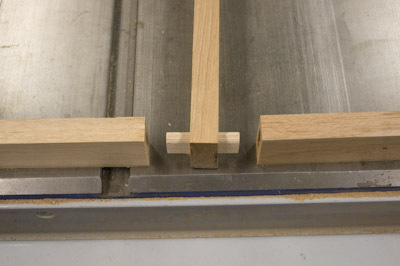 When I’m looking to strengthen a joint – glued (hopefully), often doweled, (these are the joints that fail) I want to put in something more substantial, so the Domino gives all the advantages of the tenon joint- strength of the tenon, increased glue area, part alignment and accuracy of mortise position. First I needed to make new blocks. 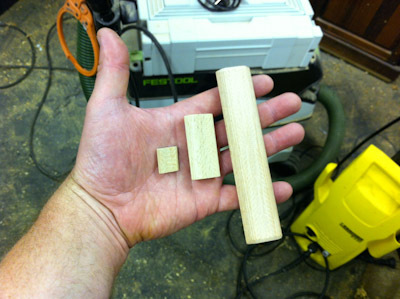 That was easy with some pine on the tablesaw, then through the drum sander to thin the blocks down a bit. 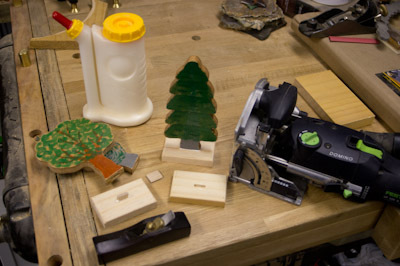 The edges were rounded using the 1/8″ Fastcap Plane from Professional Woodworkers Supplies. The actual plane is not currently listed on their site, but it is worth inquiring about – it is suprisingly useful. First seen on this site here. A very underrated tool. I use it a LOT! 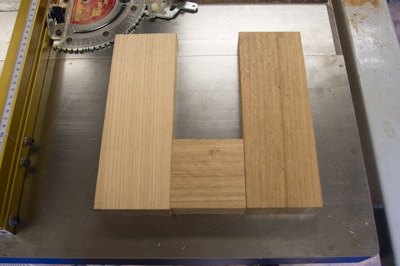 Next, the Domino (Ideal Tools) to cut the mortises for the Domino floating tenons. 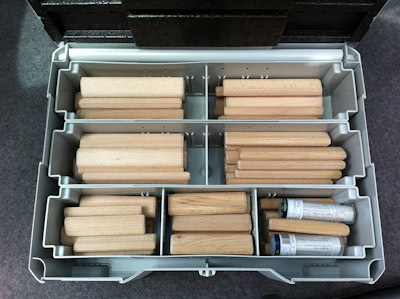 Finally, another Fastcap product from Professional Woodworkers Supplies comes to play – the glue dispenser. 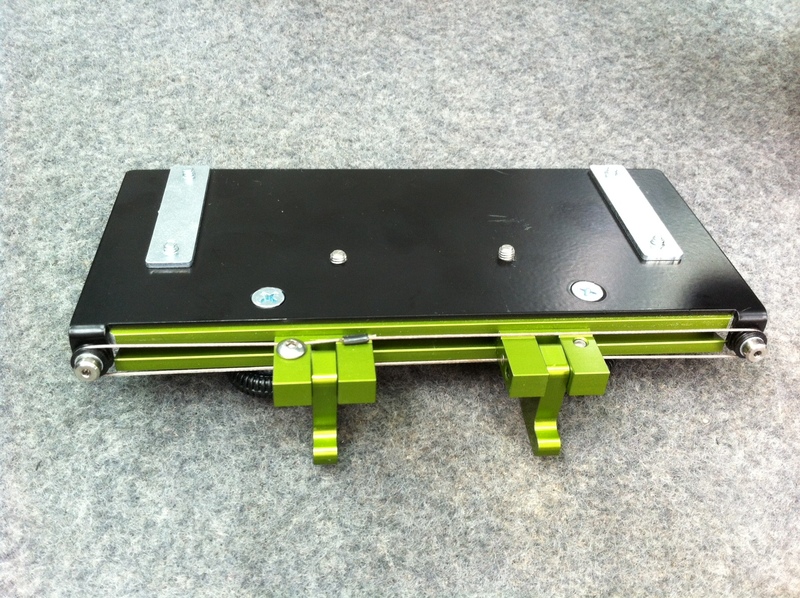 At last-year’s Festool press day, they ‘officially’ announced the DTS Engineering multistop jig as being a Festool product, despite it continuing to carry the DTS Engineering logo, which I found very unusual (it is either Festool, or it isn’t, irrespective of the product’s development source). Might be a bit of a pet niggle, but so be it. 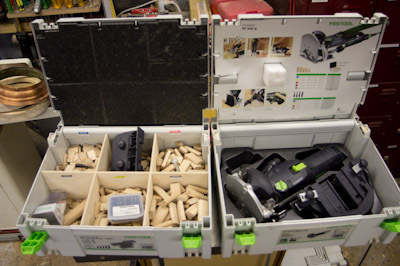 Note – there is a lot of information from the manufacturer in the comments, that has both clarified the information, and shown some from Festool (Aust) was fundamentally wrong. One of the big problems, and the reason I never bought one, was the negative press I was hearing, from multiple sources. I haven’t had an opportunity to try one out for myself to substantiate the concerns, but the opinions of experts was enough for me. After discussions with RTS, I am going to fully reserve any opinions until such time as I have had an opportunity to give both versions a full review of my own. You, my constant readers expect more from me than hearsay, so I will endeavour to fill this gap in my knowledge. Roll around 2012, and the new Domino XL has arrived, complete with a significantly superior multi stop system built in. Bit hard to see – haven’t gotten a larger photo to show, but the new system is brilliant, and I look forward to (and hope dearly) that it will be a system (or at least the concept) that can be retrofitted to the standard Domino. In the meantime, DTS have come up with an innovation for their product that has the critics reaching for their wallets. It will fit both the original Domino, and the XL version. It is getting good feedback, and looks tempting! The jaws are interconnected- move one, and the other moves the same amount in the opposite direction. I really need to give one of these a workout for myself! 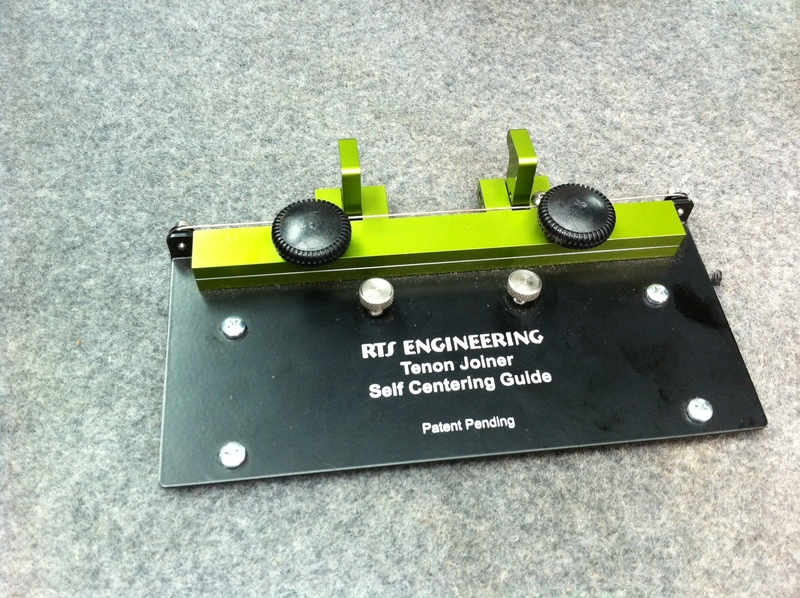 It is designed for referencing from the edge of boards only- you cannot use it to reference from one mortice to the next. From underneath, you can see the working mechanism. Clever, simple, good engineering. My sort of product! Not sure of price (at a guess, you’d get some change from $200), but something worth keeping an eye out for. Update: These are retailing at $199 (not a bad guess eh!!) 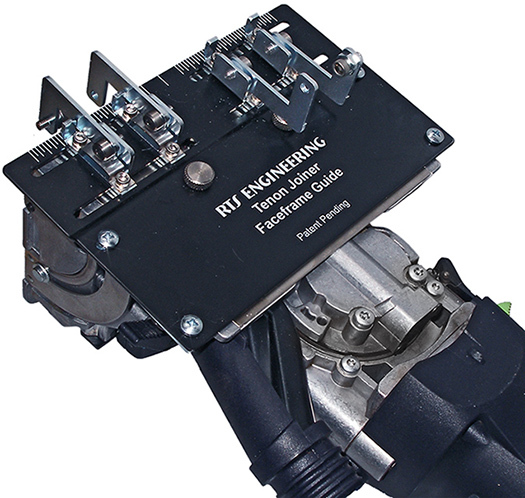 Available here from Ideal Tools.